The body’s own (autologous) fat provides the basis for three natural breast augmentation methods, which differ in terms of the complexity of the procedure and the average sustainability of the breast volume obtained. The methods range from standard lipotransfer to a complex enrichment of the patient’s own fat with her own stem cells right before implantation in the breast. Prior to implantation, stem cells are extracted from a portion of autologous fat by a complex process and added to the remaining body fat. A much longer-lasting result is achievable with this stem cell-enriched fat than with other methods of autologous fat transfer. In the long term, most of the volume normally retains, hence one procedure generally suffices. Autologous fat is concentrated prior to implantation in order to increase the number of viable cells per unit volume. When the procedure is carried out using an optimal technique, a significant part of the added volume is normally retained long-term, hence refreshments may be necessary. “Untreated” autologous fat is implanted without changing the stem cell content. When the procedure is carried out using an optimal technique, only a small portion of the volume is normally retained long-term, hence refreshments are necessary. Breast augmentation with stem cell-enriched autologous fat (Cell-Assisted Lipotransfer, CAL) is an outpatient procedure performed under local anesthesia. General anesthesia and a hospital stay can be waived. The necessary steps (liposuction, enrichment of the autologous fat with stem cells, implantation in the breast) take a total of approx. 3 to 5 hours. 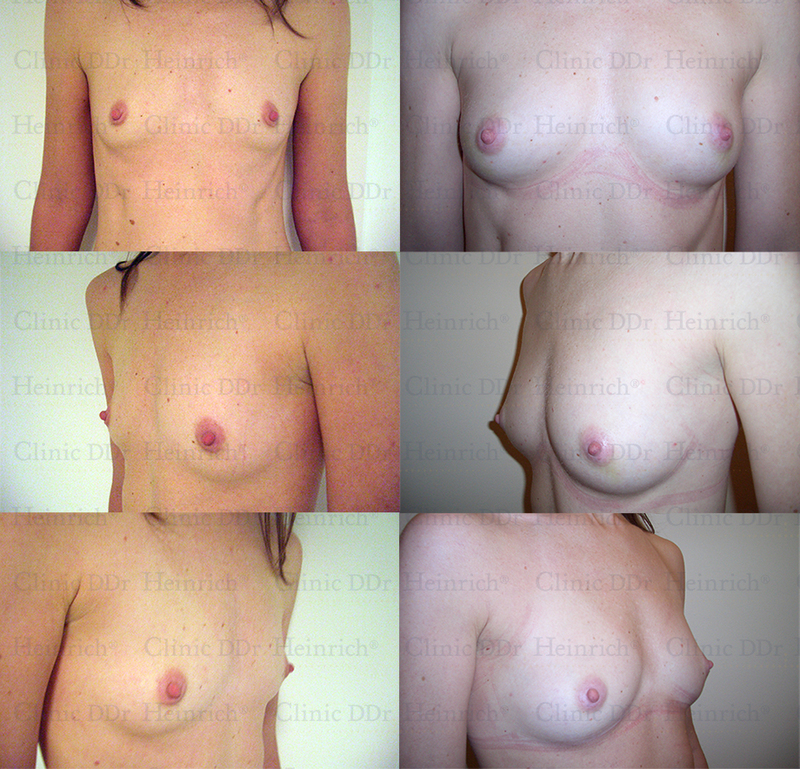 The second step is omitted in breast augmentation with standard lipotransfer. The patient is discharged home on the day of the procedure. Aftercare is minimal compared to breast augmentation with silicone implants. The liposuction used to obtain the body fat is performed employing a gentle technique invented by DDr. Heinrich by means of precise manual work without utilizing mechanical suction devices. Commonly body fat is harvested from the buttocks, hips, and thighs, or, if desired, also from other body regions. The liposuction can be performed with regular cannulas or with higher-quality genuine microcannulas. Depending on the patient’s wishes the obtained fat can either be injected into the breast without further preparation (standard lipotransfer) or after stem cell concentration or stem cell enrichment (stem cell-concentrated or stem cell-enriched autologous fat transfer). I just wanted to let you know that I am very happy with my result. I can hardly believe that I can now wear a size C cup and that at 58 years old I look better in a swimsuit than I ever did before. Nancy D. , Los Angeles, U.S. The results of breast augmentation with autologous fat impress with their naturalness and youthful firmness. Because the volume increase is achieved with autologous fat tissue rather than artificial foreign materials, the augmented breast feels completely natural and looks “real” in any body position, whether at rest or in motion. Furthermore, the local rejuvenating effect of the stem cells gives the breasts a more youthful, firmer, and more taut appearance. In the scope of a breast augmentation anywhere from approx. one half to two cup sizes is achievable in a single procedure. An increase of one cup size is typical. The injection needle prick sites are similar to those for drawing blood and heal without leaving scars. As a general rule most of the volume normally retains in breast augmentation with stem cell-enriched autologous fat. Refreshments are thus usually unnecessary. The less strain a medical treatment puts on the body the faster healing proceeds as a general rule. In order to make the procedure as gentle to the body as possible, all of our three autologous fat transfer methods are performed under local anesthesia, waiving any kind of scalpels. Specific recommendations regarding aftercare are always partly depending on the individual life circumstances (e.g., profession, type of sports, etc.). During the aftercare period it is generally important to not load the breast in the first few weeks. Thus you should refrain from abrupt movements and lifting heavy items (e.g., carrying heavy bags, certain types of sports such as breaststroke, tennis, etc.). A sports bra has to be worn for about 4 weeks. It is necessary to wear compression garment for 1 week if the liposuction was performed with microcannulas, 4 to 8 weeks if regular cannulas were used. With the restraint regarding to lifting of heavy items our patients are commonly able to work already 2 to 3 days after the procedure. Individual check-ups take place by arrangement. I am more than satisfied with the result of my breast augmentation. Now that the bruises and injection sites have healed, there are absolutely no visibles signs revealing that I underwent surgery. All that’s left are augmented breasts that look completely natural. I am glad that I decided to undergo this procedure, and I wouldn’t hesitate to do so again.